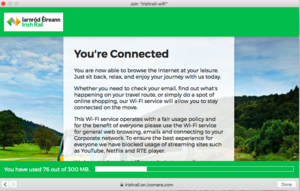 A very limited data allowance on Irish Rail Wi-Fi. YouTube works just fine… but not for long! Posted in Misc and tagged Irish Rail, wifi at 2:40 pm on February 19, 2019 by Bodger. It’s free mobile internet shared by everyone on the train – what type of bandwidth do you expect? They’ve limited bandwidth so they can’t deal with every second person on the train streaming netflix or youtube. Totally. Seems like a eminently sensible way to provide a service. A complimentary service…surprised you missed that!?! have you seen the cost of train tickets? pretty much unusable on the Dart – you can barely load Twitter, never mind stream videos. Agreed, I’ve commuted for last 5 years from Skerries to Dun Laoghaire, the wifi is practically unusable for the vast majority of that journey. The aul black spot in Portmarnock gets me every time. Also, one end of the county to the other is a rough commute. Building up quite the dossier now. Don’t waste your time Bertie, i know for a fact that millie is a south sider. What??? An entire Dart journey with no Twitter? How will we know where you are and what you are looking out the window at? First world problems people! Read a book! As a regular(-ish) traveller on the Intercity from Sligo to Dublin, I use 4G (where it’s available), as the train wifi just does not work well enough. It takes too long to log in, trying to use it for anything that needs more bandwidth than twitter is painful, and you still reach your limit too soon. It’s a three hour journey and the 300MB limit is just too small. Not to mention the fact that if you can’t go a couple of hours without streaming hundreds of megabytes of data you need to take a long hard look at yourself and make some changes. The “telecommunicative principles”? You arrogant willy. I’ve just returned from a short trip to our neighbouring island. Fast and free WiFi on HST and on commuter trains, even on the local buses. There are no insurmountable technical issues with providing this as many other nations have shown. Iarnrod Eireann are a cowboy operation and their onboard WiFi is poo. They provide the bare minimum just so they can put the WiFi sticker on the window of the coach. In ’s otherwise promising National Rail Passenger satisfaction survey, only 30% of UK passengers were satisfied with onboard WiFi, a rating so low that even train toilet facilities ranked as a more successful category. You’re excelling yourself now, Cian. Are you telling me that I didn’t experience fast WiFi on GWR trains? An anecdote is not data. 300mb is an entirely reasonable amount of data for a free WiFi service. Thats enough for ages of browsing webpages/sending emails. It just precludes streaming of videos, which is a fair enough compromise, given the price. The price? They’ve paid plenty for the train ticket. Listen I spent 5 years earning the right to be arrogant about telecoms in the direction of people like yourself so you can just sit there and take it bucko. I could tell you things about convolutional error control coding that would make you literally die of boredom. Some UK rail operators have the volume to justify fancy trackside femtocell deployments, we don’t. They also have substantially higher ticket prices than ours. And even then it’s only on certain routes, and a lot of the time it’s not free if you’re not in first class. As detailed here http://www.nationalrail.co.uk/stations_destinations/44866.aspx. Your personal story illustrating the UK as the land of milk and wifi is not the general case. I somehow knew you were an IT guy. I wonder what the clues were? He turned you on then turned you off again, straight away? Don’t you dare tar me with that IT brush, it’s frankly offensive to me. I’m an electronic engineer.